You are here: Home » Blog » Energy Systems » After Sandy: Mitigation or Adaptation? A decade ago, concern about climate disruption focused mainly on mitigation. How could the world drastically reduce greenhouse gas emissions to curb the severity and frequency of extreme weather events? With global treaty efforts in tatters and Washington in gridlock however, the focus began to shift to adaptation. How can the damage from climate change be reduced? Even a cursory look at the destruction wrought by Hurricane Sandy – a waterlogged landscape, natural gas explosions, devastating fires, shortages of food, water, and gasoline, and vast areas without electricity — makes it clear that we must do both. Courtesy of DOE/NREL, Credit – Connie Komomua. Normally, a microgrid functions as part of a larger regional or national system. Electricity is generated, stored and supplied locally. At the same time, power is exchanged with the rest of the grid to reduce costs and maintain a high level of reliability and performance. In an emergency, however, a microgrid will cut itself off automatically from the stricken network. Instead, it goes into “island” mode, continuing to supply local customers essential needs. That would prevent problems like the one during Hurricane Sandy when an explosion at a single substation caused a massive blackout in Lower Manhattan. Of course, microgrids cannot protect specific locations from flooding or damage. That is a different kind of problem. But with a system of interconnected microgrids, much of the essential equipment in Lower Manhattan out of the reach of flooding would have kept operating. Putting microgrids at the core of the transformation of the electrical system will end total dependence on a vulnerable, overly-centralized system. The replacement will be a distributed, intelligent system whose essential parts are much more likely to function without disruption during extreme events. In addition, a system based on microgrids is also well-matched to greatly increasing efficiency of electricity use. The higher the efficiency of use, the larger the number of functions a micro-grid in island mode can supply. Higher efficiency also means that a much larger part of the economy can keep functioning at any given level of power. Buildings that are well insulated will stay warm longer without the heating system functioning; food will be preserved much longer without power in highly efficient refrigerators. Crucially, this technology, built for adapting to climate disruption will also mitigate it by helping to reduce greenhouse gas emissions. As they consider how to protect the region from extreme storms and floods, Governors Christie and Cuomo and Mayor Bloomberg should appoint a task force to create a roadmap for building a distributed resilient efficient and intelligent grid in New York City, Long Island and the Jersey shore. Such a project could be the core of the infrastructural transformation that is needed all along the Gulf and Atlantic Coasts. 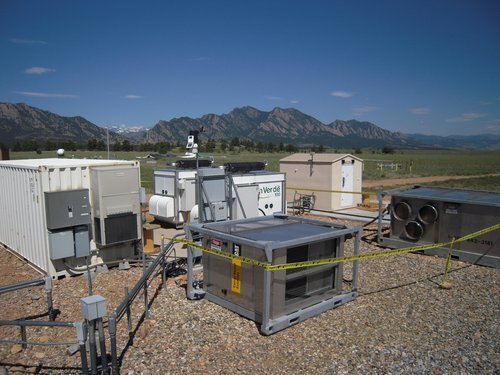 Interconnected microgrid networks can enable people and the economy to flourish in the new normal of more frequent and more violent weather events. Categories: Energy Systems. Tags: climate change, electrical system, and microgrids. Posted on November, 2012. Last modified on December, 2012.